We are pleased to announce Perth-based artist Jina Lee as the recipient of the Sculpture by the Sea, Cottesloe 2018 Rio Tinto WA Emerging Sculptor Mentorship. The $10,000 Rio Tinto WA Emerging Sculptor Mentorship Program was introduced in 2015 to encourage professional mentorships between emerging sculptors and established practitioners over a 12 month period with a number of face-to-face meetings. Jina selected French artist Nicolas Bertoux as her mentor for the program due to his vast experience in public sculpture, specialising in stone. 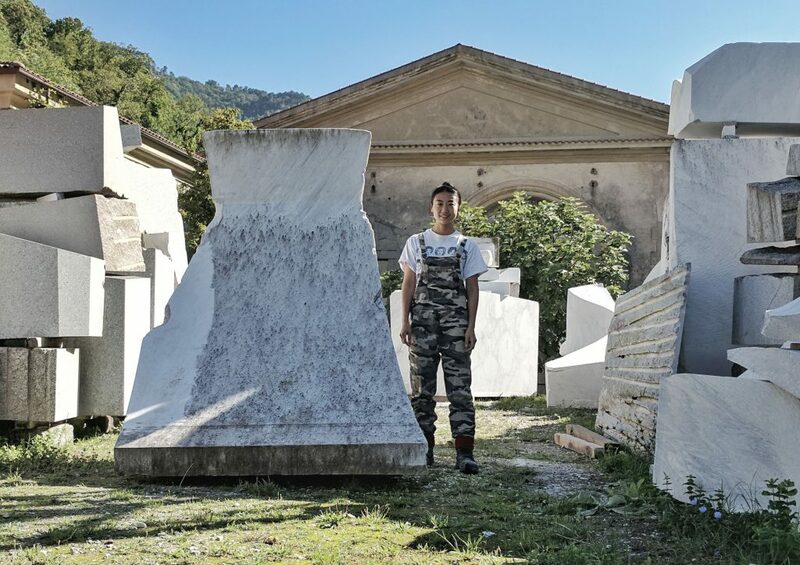 Jina travelled to Nicolas’ studio, Artco, in Seravezza, Tuscany for five weeks to develop her skills in stone carving for large scale sculptures. The beautiful Carrara marble work she created during her time in Italy will be shipped to Australia to exhibit in Sculpture by the Sea, Cottesloe 2018. Jina Lee is a stone sculptor and her focus is on simplified organic shapes sculpted into a variety of stones, primarily using marble or granite. Jina began her study of sculpture at Kaywon Arts School in South Korea in 1999 and completed her Master of Fine Arts, majoring in Stone Sculpture at Kookmin University, South Korea in 2009. She has participated at international sculpture symposiums in Japan and produced sculptures for public spaces and private collections in South Korea, Australia and Switzerland. Since arriving in Australia in 2013 Jina has exhibited in a number of important group exhibitions including: Sculpture by the Sea, Bondi (2015), the City of Melville Sculpture Walk (2014, 2015, 2016) and Swell Sculpture Festival (2014). She has been an artist in residence at Greg James Sculpture Studio Gallery, J SHED in Fremantle WA since 2014 and is supported by a local stone business. Congratulations, Jina, and we look forward to seeing the fruits of your labour when you exhibit for the fourth time at Sculpture by the Sea, Cottesloe, which runs from 2 – 19 March 2018!